Christmas was way too early for us. Raleigh USA just sent us a One Way to review! The One Way is a flip flop fixie single speed commuter made with Reynolds 520 Steel Baby! 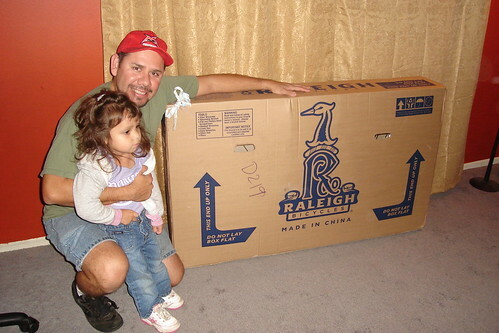 Here’s Moe salavating at the sight of the box with his little lady, Ellyse. And yes this big mess becomes a bike…thanks to the help of my magical-mechanic hands…and Moe’s too! Moe adjusting a few more things. Did you notice the reflective sidewalls on the tires? Crazy huh? All finished and all smiles. Here’s Moe on the One Way’s maiden voyage. Man those tires are super cool! Another shot of the reflective tires. So stick around for a review of the One Way. I will be joining the ranks of Nick & RL going ‘fixie’. I’m dialing in the One Way and I expect to ride it tomorrow to work. I’ll be riding with the freewheel while I get used to the bike. Stay tuned for my first impression! that looks like it would make an ideal winter bike. With clearance for 700x35c tires, you could even throw on some Nokian Hakkapeliittas. Moe: If you expect to get the hang of fixed gear riding, you have to do it for at least a week or two without getting on another bike. Otherwise, it will never really feel familiar and you’ll keep trying to coast. On that note, RL, Have you kept up with it or did you swap the RedLine back to a singlespeed? Good advice Nick. I’ve been riding it as a Fixie. In fact, I just rode it to the gym this morning. After all its more fun to ride without deraillies. I know how to slow down, but I still have to use my brakies. 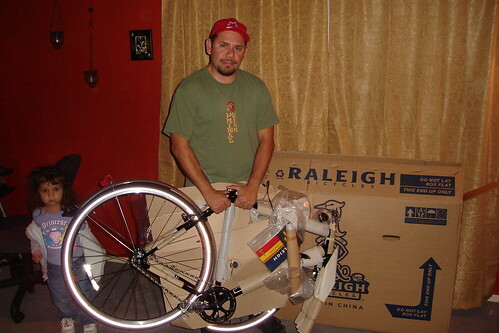 It will be hard to ride just one bike for 2 weeks, but I’m planning to ride the Raleigh exclusively to work after I’m done with the Urban Xtreme review. There’s been weeks that I ride a different bike every day to work (yeah, I have that many bikes). People at work think I’m weird, but my answer is: Try driving a different car every day to work!! In case you weren’t sure, RL, I was making fun of you for using the diminutive form to describe your fixed-gear bike. 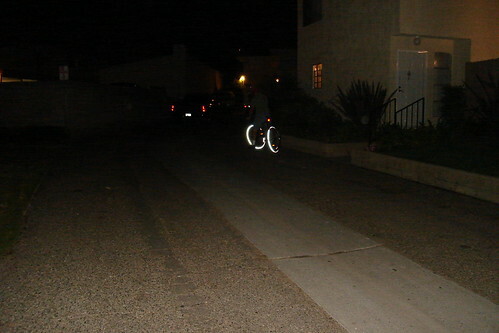 There’s a technique for stopping that most fixed-gear and track bike riders use on the street — one that I have yet to master — where you lift your weight off the rear wheel, lock your legs, and put your weight back down on the rear wheel, causing the wheel to skid and thus slowing the bike. When people ride track bikes without brakes, this is how they slow the bike. The trackstand is another thing I’m still lousy at, and until I can do both of these things well enough to actually use them in traffic, I consider myself an amateur. You can do it, Moe. I only have one bike, now that I’ve given my old Dahon to my brother. I guess I’m a bike monogamist. Switching between bikes might keep you on your toes, but I like riding the same bike all the time. You really become one with the machine. This may sound silly, but when I was a kid I used to rue the fact that I couldn’t just get down on all fours and run like an animal. Walking is too slow, and running as a biped just doesn’t have the flow of a cheetah or a horse, and I was jealous of that. So, for me, biking is the closest I can get to running on all fours, especially with my seat as high and my bars as low as I keep them. 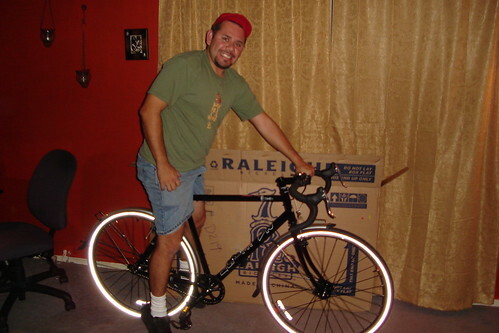 I have been interested in getting a fixed gear bike for about a year now but I just can’t seem to make the jump. My situation is that I bought a nice road bike a few years ago thinking I was going to ride it and yet it sits in my rafters collecting dust. I don’t know if it was the race geometry, or the fact that I we have two small children about that keeps me from getting out. Anyway, I would hate to buy another bike only to have it turn into garage fodder as well. Never the less I would like to get a fixed gear bike because of the appeal of being connected to the drive line (I used to ride unicycles a lot in my youth). That and the fact that they look like fun. So with that said, I would like to read about your first impressions on the One Way, as there is a limited amount of feedback on the net about this particular bike. Just looked at the Raleigh One Way….nice bike. I think the reason I went for the Redline 925 was the Black fenders (didn’t care for the chrome on the one way) and the moustache bars. I like to stay upright when riding in traffic…..drops on the one-way are not ideal for my commute. Otherwise they are very similar. 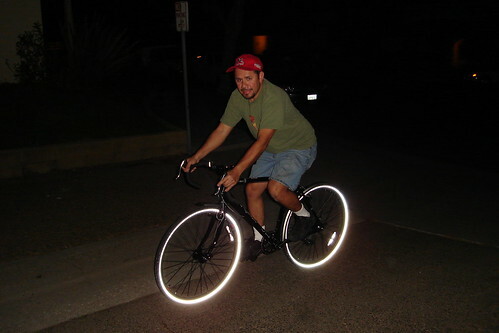 I do like those reflective tires though.